to match the growing needs of your practice. Patient Records/Charting View extensive patient records, with full patient information in a logical fashion at the click of a mouse. 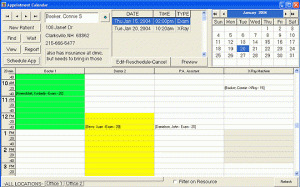 Maintain Administrative Patient File Notes Have patient file notes available for quick viewing and printing from any screen. Maintain Patient Guarantors Label files with their guarantors and keep your billing professional and pristine. Maintain Patient Referrals Record on a patient’s file how he/she was referred. Quick-Charge Entry System With functions like ‘Recall Last Visit,’ QuickPractice boasts the best Visit Entry interface. Quick-Payment Entry System You’ll have complete control to apply payments to specific procedures.Click the ‘Auto-Apply’ or ‘Apply-Evenly’ buttons to speed you through your day. Patient Receipts Print Quick receipts on demand for patients. Patient Statements Show Transactions for Pat/Ins/Both, specifiy any Date Range, show Balance Forwarding. Insurance Billing Insert pre-printed HCFA-1500 forms or let QuickPractice print the form for you. 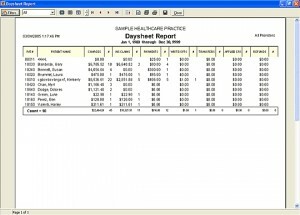 Daysheet Reporting See per-patient totals for charges, billings, payments and write-offs. Accounts Receivable Reporting See per-patient Accounts Receivables totals, including 30/60/90/Over 90 columns. Codes ManagementQuickPractice allows you to organize and maintain Diagnosis, Procedure, Dispensing, Place of Service, Type of Service and Modifier Codes, giving you full control over adding or changing them. Lists Management Lists of Referring Providers, Insurance Carriers, Occupations, Claim Types and more, help you with faster data entry and lookups. Password Protected Control who can access your data stored in QuickPractice. 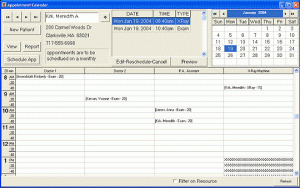 Appointment Calendar This is a sophisticated method of keeping track of all data related to scheduling. Setting an appointment is as simple as clicking on the date and time. Set as many appointments as you wish for any time slot or interval. Manage and Track Insurance Policy Information Policy Information, Deductibles, Percent Covered, Patient/Insurance Co-Pay, Start/Stop dates and Allowable Visit Limits are automatically updated. Multi-Case Management Treat patients for multiple cases at one time, all managed within the same file. True Ledger Our True Ledger give a chronological representation of Charges vs. Payments. Over 17,000 Codes You’ll receive over 17,000 ICD, HCPCS, Place of Service, Type of Service, and Modifiers. QuickPractice allows you to create your own personal list for your practice. S.O.A.P. Notes This feature speeds you through writing Subjective-Objective-Assessment-Plan notes. QuickPractice lets you create multiple sets of master notes to rapidly produce complete individual observations (in your own words) without cumbersome, inconvenient bar codes or often-inappropriate ‘canned’ notes. Advanced Patient Billing Enhanced functions to give you more control over your patient billing, such as specific case type. Third-Party Billing Control who should receive patient bills and statements if the patient is not the one responsible. Advanced Insurance Billing Enhanced functions to give you more control over you insurance billing, such as specific case type, specific provider, specific visit date. Advanced Reporting Gain more control over your financial destiny with quick and easy Charge, Billing and Payment Reports. Advanced Data Viewing All Codes, Lists and Providers have a ‘Query’ and ‘Report’ function to sell all patients using that item (i.e., see all Medicare-only patients). Total Password Protection Allow user-level security password protection to restrict users to certain functions, giving you complete control over your practice management. Pop-Up Practice Reminder This unique reminder serves as a multi-function alarm clock. Have instant access to information such as unbilled visits, missed appointments and dates of last backup. Import & Export Import and Export data from or to QuickPractice via other programs, such as Microsoft™ Word and Access. Advanced Appointment Calendar Functions Recurring, Find Next and Waiting List are some of the powerful features you’ll have in the Colorized Appointment Scheduler. Batch Payment Entry One payment from insurance carrier to many patients. Memorized Transactions Repeat visits are a snap with Memorized Transactions. Combine Charge & Payment Entries in a single, one-step process. Professional Patient Billing Maximize Patient Billing functions and capability. 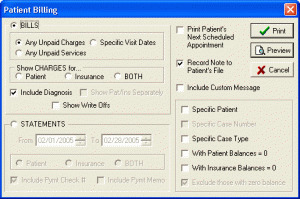 Print Next Appointment, Record Patient Admin Note, and add Custom Billing Messages and more. Professional Insurance Billing Maximize your Insurance Billing functions and capability, allowing you to generate bills for specific patient lists, insurance carriers, visit minimums and maximums and even by treatment code, etc. Custom Reporting Tool With our library of 130 custom reports, you can have virtually any report you wish at your fingertips with our easy-to-use Custom Report Generator. Graphical Practice Statistics Get a comprehensive look at your practice with a full range of graphical statistics. Colorful graphs and charts correlate and display data from every segment of your practice. Patient- Relationship Marketing Show patients you care.Specialized marketing routines will, in seconds, create postcards, mailing labels or a telephone list to help you build patient relationships. Multiple Fee Scheduling Allow each Procedure Code to remember different fees for different Case Types. On-Demand Forms Generator Our Forms Generator prints the forms you need as you need them. Generate Sign-in Sheets, Assignment Authorization, X-Ray Releases, and more, by instantly merging practice and patient data where applicable. Store Digital Photographs Take a Quick Picture of your patient, and store it in the patient’s file. Patient Travel Sheet/Card Print out a travel sheet for a comprehensive reference as you prepare to treat patients. Includes current dx, record of previous visits, correspondences, payment information and future appointments. Integrates with QuickBooks® Share your QuickPractice data with QuickBooks®. Employee Time ClockKeep track of employees’ hours for easier payroll preparation with our built-in time clock. Keep track of all your services, procedures, supplies, insurance claims, and much more. Transfer your payments received directly into your QuickBooks checking account/income account. Save countless time and money for your practice. QuickPractice Professional’s integration with QuickBooks joins the perfect patient accounts receivable program with the world’s best accounts payable/financial reporting program. Now you can transfer your payments received directly from your QuickPractice file into your QuickBooks checking account/income account. This seamless integration eliminates double data entries, minimizes errors and saves countless time and money for your practice.